4 April 2019 The winners of the prestigious Ceva Animal Welfare Awards 2019 have been announced in a glittering ceremony in The Mercian Suite at the Birmingham Conference & Events Centre in Birmingham, following a record-breaking number of nominations of the highest calibre for the third consecutive year. The awards were hosted by TV presenter and animal lover, Matt Baker, and renowned retired veterinary surgeon, Chris Laurence MBE FRCVS, who puts his name to the Vet of the Year Award. They recognise the achievements of remarkable people from the farming, veterinary and charity industries, who go beyond the call of duty to better the lives of animals around the world. The awards’ ceremony on 3 April in the run up to BSAVA (British Small Animal Veterinary Association) Congress saw praise bestowed on all the shortlisted nominees and winners were announced across eight categories. Hannah Capon developed Canine Arthritis Management (CAM) to raise awareness of arthritis amongst dog owners and fellow veterinary professionals to create effective long-term management plans. She has tirelessly and relentlessly brought together animal welfare professions to provide support and education to dog owners all over the world. Hannah has adopted a holistic approach to lifestyle, living environment, medications, complementary therapies, weight management and nutrition which demonstrates that she promotes gold standard care and the CAM booklets that are utilised in veterinary practices have received good feedback from owners who feel that they have a good structure. The CAM website is a fantastic source of educational support to both vets and owners with the prime objective to relieve pain and distress for dogs suffering with arthritis and Hannah has spent over £10,000 of her own money to produce short films to highlight arthritis and the work of CAM. Rachel Wright is founder of TOLFA (Tree of Life for Animals). A charity set up in 2005 to alleviate the large-scale suffering of animals on the streets of Rajasthan in India. Through Rachel’s vision and leadership, TOLFA has established a loyal and dedicated team of staff in India who deliver high quality animal care services in circumstances that are often challenging. TOLFA offers its services through four main projects – Rescue & Care, Rural Animal Health, Anti-Rabies & Sterilisation and Education. In 2018, the charity rescued 6,392 animals, providing 107,492 individual treatments to those animals. TOLFA’s rescue team responded to 9,801 emergency rescue calls in 2018. 14,741 animals were treated through Rural Animal Health, with 12,968 being goats belonging to subsistence farmers and the poor. Ebony Horse Club believes that riding and horse care can have a transformative effect on young people growing up in South London’s most disadvantaged communities. The charity teaches life skills, builds confidence and provides opportunities. Led by David Fleming, the dedicated and patient team of people at Ebony Horse Club work with the eight ponies in residence to turn children’s lives around. The horses’ health and welfare are paramount and the children are educated on all aspects of stable management and welfare ensuring that they take their learnings home with them leading to better welfare of their pets in the home environment. Fiona has worked 24/7 to rescue and rehabilitate hundreds of dogs a year for the last 40 years. She also takes on horses and cats. She has built up an incredible relationship with the traveller community and because of her many, many traveller dogs have better living conditions. She has worked tirelessly to convince travellers to neuter their animals and she provides the community with vaccinations, worming and flea treatments and mange treatment. Every dog she rescues is given an opportunity to recover and find a great home and any animals that are not able to be rehomed she takes into her own house. Every penny raised for the rescue goes back into the animals, including much of her own money. She single-handedly rescues over 300 dogs a year and neuters many more. David is a pioneer in the management of dairy cows and calves to ensure his enterprise is both welfare friendly and financially stable. He is not afraid to challenge conventional thinking and try novel approaches that maximise animal welfare, but always with a pragmatic approach to running a successful business; he is therefore a role model for other producers who may wish to adopt some of his farming methods. David has been investigating ways to sustainably manage his organic herd over a number of years, including participation in projects to control gastrointestinal parasites in dairy youngstock and the management of male calves derived from the dairy. In particular, David has recently concentrated efforts on the management of extended suckling of dairy calves with their dams and ways to manage the stress of weaning calves. He has invested significant time and effort looking at optimising the management of extended suckling and the system is now showing significant returns for cows and calf health and welfare. David has consulted with veterinarians and animal scientists widely and has allowed use of his production records and animal health data by undergraduate veterinary students keen to investigate the extended suckling system further, whilst learning how to undertake research projects and learn about dairy cow management. This has led to increased awareness of cow and calf rearing practices with vets, students and the wider farming community and David is actively participating in work to see how extended suckling could be applied in other farming systems. He is always very enthusiastic about involvement with knowledge sharing forums and has a genuine belief in working to improve cow and calf welfare. James Griffiths is a second generation dairy farmer at Taynton Court Farm in Gloucester, who has recently been joined on the farm by his son, Jack. They currently milk around 700 Holstein-Norwegian Red cross cows on an all year round calving system, largely housed indoors, plus a second group of around 300 Jerseys as a spring calving grazing block. Cow comfort and welfare is a high priority on the farm. What he had done in the last 30 years has been widely watched and commonly copied by other farms, so the impact that he has had on dairy cow welfare nationally has been enormous. The farm was one of the first to instigate frequent foot bathing for the control of digital dermatitis some 20 years ago which has become widely adopted by other farms in the UK, which has resulted in a huge reduction in lameness nationally. New freestall barns with bigger freestalls have been built on sand bedding to maximise lying time. Increased width of shed passageways minimise faecal contamination of feet. There is a routine foot trimming programme and strips of rubber matting are used to maximise cow comfort when eating. Although housed for a large part of the year, infectious lameness (DD or foul) on the farm is now rare, running at just 3.4 cases per 100 cows pa. Farm staff have been invited to present their cow lame protocols at the UK Dairy Event on more than one occasion. Freestall barns provide great ventilation and a clean environment which means that the incidence of respiratory disease and clinical mastitis is low. James has installed a new state of the art rotary parlour to milk cows as efficiently as possible. Milkers are trained in best practice. Herd cell count is running at well under 150 and clinical mastitis levels are well below 30 cases per 100 cows. Due to improvements in mastitis management and environmental changes, less than 10% of cows get antibiotic dry cow therapy. The farm has invested heavily in cattle handling equipment to make procedures like TB testing and routine fertility visits less stressful. A modern hydraulic foot trimming crush is used for the treatment of lame cows and a recently installed 75 point rotary has reduced standing time and lameness. Staff motivation is a high priority and team members receive regular training. The farm is part of a group of other farms in the Gloucester area who are all involved in training; they visit each other’s farms annually to make a ‘welfare assessment’ of other members of the group. Other ideas instigated on the farm include the use of acidification of milk in the control of Johnes, which has been the subject of studies by both Reading and Nottingham Universities. The farm welcomes visits from those with alternative views such as the RSPCA and CIWF and are constantly looking at new ways to improve the health and welfare of its herd. Ian MacFarlaine has volunteered or worked in animal welfare for 30 years (including previously two years with International Cat Care) and continues to strive to improve the quality of life for unowned cats through TNR, improving homing practices or working with authorities and NGOs to bring a collaborative approach to improved cat welfare. His enthusiasm to learn and to teach others remains undaunted by the size of the task, and his professionalism and knowledgeable approach is credible and practical in the many different situations in which he has worked, from well-off charities to small struggling NGOs. Ian is a qualified veterinary nurse and has wide experience in animal welfare, from running shelters to training, inspectorate, neutering manager, animal welfare officer, community engagement, population management, TNR training, project management, dealing with hoarding cases, supporting local groups and building relationships with multiple stakeholders, including government ministries. He has contributed to conferences, workshops and training of students where his dry wit and humour make his lectures memorable. Over the years he has worked with major charities both in and outside the UK including Cats Protection, Mayhew, Wood Green and PDSA and has established a joint municipal/NGO cat neutering facility in Portugal, and undertaken projects in the Sudan, Lithuania, Ireland, Tanzania and India. Ian is currently working in Bermuda, but before that he made major changes at the animal centre at the Malta SPCA which was suffering increasing poor rehoming rates – cat homing increased more that 100% under his management. One individual was given special recognition during the evening. The Outstanding Contribution to Animal Welfare Award in association with Your Dog and Your Cat was presented to Professor Jacky Reid, Honorary Senior Research Fellow at the University of Glasgow and CEO of the innovative research company, NewMetrica. Jacky and her multi-disciplinary team of renowned academics from the University of Glasgow have dedicated over 20 years to researching pain and quality of life measurement in pets. Her work into these vital areas at the University of Glasgow and, since retiring from the University, as part of NewMetrica is truly innovative and widely respected and she works tirelessly to broaden its reach for the benefit of the welfare of animals. For further information on the Ceva Animal Welfare Awards visit www.cevawelfareawards.com. 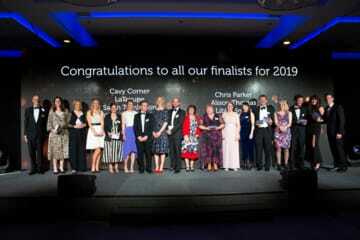 For full details of the category winners and the awards shortlist please visit www.cevawelfareawards.com. Images and videos from the awards’ ceremony are available to download from https://www.dropbox.com/sh/iu7tj8j8ruy3sho/AAAaOPS1RQodZ1QSInMGBhAua?dl=0. Interviews with category winners and the judging panel are available upon request. Additional comments, images from the night are available following the #CevaWelfareAwards2019 hashtag on social media.